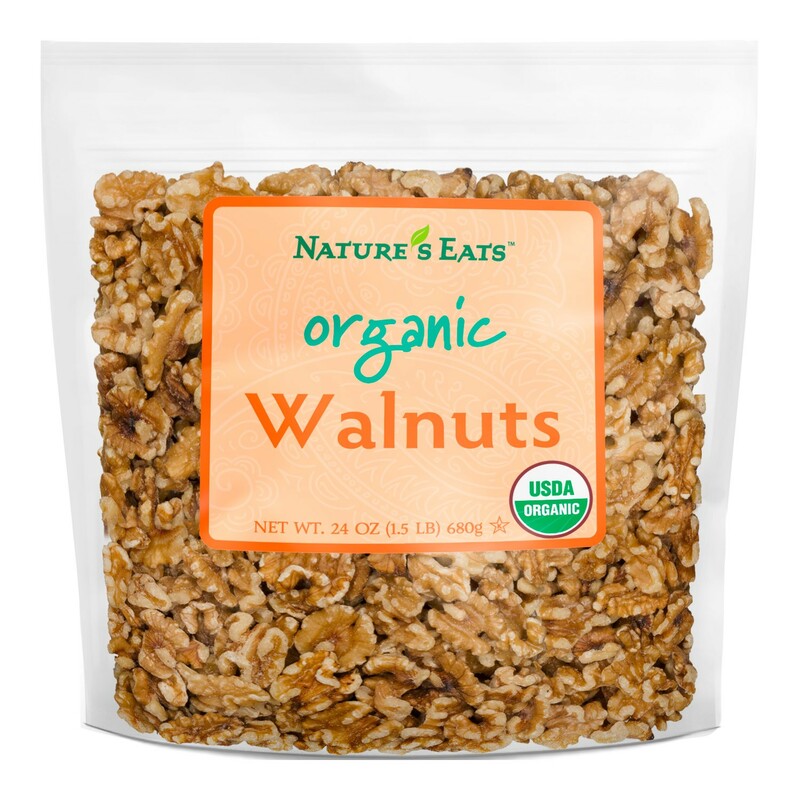 Organic walnuts have a delectable nutty flavor, and a crisp, buttery texture. Excellent when used on oatmeal, yogurt, ice cream, or baked into muffins, breads, cookies, and snacks like spiced nuts for the holidays. Combine them with whole-grain cereal and dried fruit for a healthy trail mix. Believed to improve body stamina, walnuts are considered a ‘power food’. Loaded with protein and fiber, raw organic walnuts are an excellent source of omega-3 essential fatty acids. Along with their delicious taste, walnuts contain significant amounts of nutrients such as proteins, EFAs (essential fatty acids), carbohydrates, vitamins, and essential minerals. Among nine different types of raw and roasted nuts, walnuts are the leading source of polyphenols. The latest research on the nutritional benefits of walnuts shows that a handful per day may help improve memory, concentration and information processing speed. BRAIN HEALTH: It is not a surprise that walnuts are good for the brain, considering the nut unshelled resembles the brain. The walnut contains several neuroprotective compounds like Vitamin E, folate, melatonin, antioxidants and omega 3 fatty acids. In studies, these omega-3 fats are suggested to reduce oxidative stress that takes place with aging. It also helps enhance cognitive and motor functioning in aging. The brain consists of almost 60% fats so we can conclude that the omega-3 fats found in these nuts are highly beneficial for our brains. CARDIOVASCULAR & HEART HEALTH: The second organ that the walnut resembles is the lungs. The amino acid L-arginine in walnuts offers various cardiovascular benefits for those with risk of heart disease due to cardiac risk factors. The omega-3 fat alpha-linolenic acid (ALA) found in walnuts is also anti-inflammatory and helps prevent pathological blood clots from forming. Research shows that people with high levels of ALA in their diet are less likely to have a heart attack and a 50% risk reduction for sudden cardiac death. The form of vitamin E found in walnuts is gamma tocopherol, which has been shown in cardiovascular health studies to reduce heart problems. ANTI CANCER BENEFITS: Some phytonutrients like; quinone juglone are not in other commonly eaten foods, but available in a walnuts. In addition, phytonutrients like tannin tellimagrandin or flavonol are also rare and valuable for their anti-inflammatory benefits. These anti-inflammatory benefits have been known to assist with certain cancers like breast and prostate cancer. A study on mice that consumed walnuts as their source of fat relative to a control group saw a smaller and slower growth in the prostate tumors over an 18-week period. As with other nuts, walnuts are commonly used in vegan and vegetarian dishes. They are an abundant source of nutrition and a delicious addition to main dishes, salads, or desserts. They are also a substitute for pine nuts when making pesto sauce. Although the outside skin of the walnut contains 90% of all the antioxidants of the nut, the skin can be bitter, so it may be useful to remove the skin in some recipes. 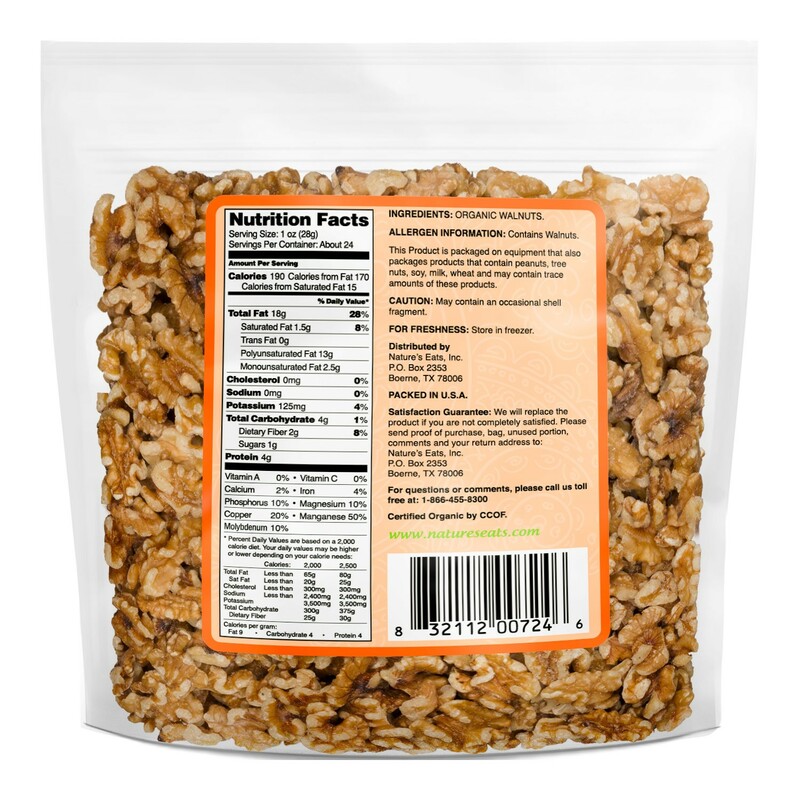 Buy organic walnuts at eatnuts.com. With a delectable nutty flavor, and a crisp, buttery texture, these organic walnuts are sustainably sourced from Spain and California.